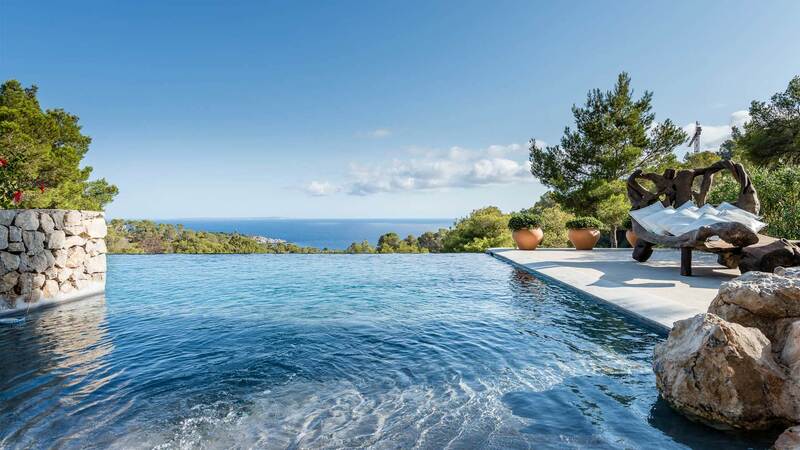 This sublime villa is located in one of the most unspoilt areas of Ibiza, surrounded by pine forests, with a superb view of the south coast. 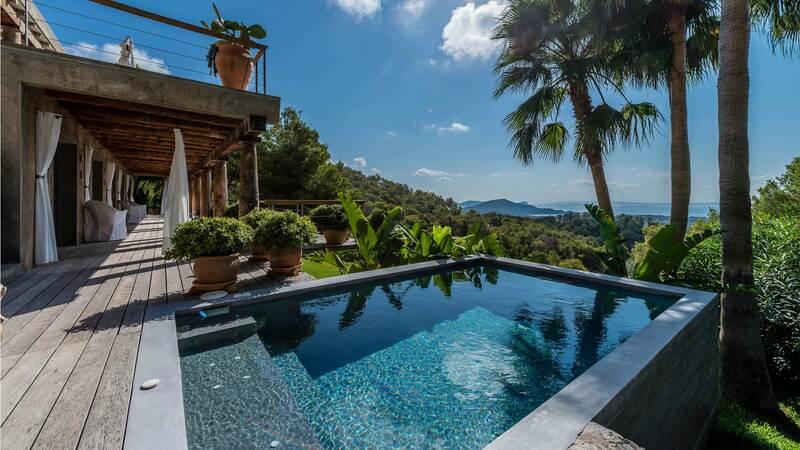 Enjoying a plot of over 3 hectares, this villa also offers breathtaking views of the sea. The 660 m2 villa with annexes offers you its architectural beauty and elegant accommodation in one of the most beautiful places popular on the island "Es Cubells". This 6 bedroom house offers a high level of service and has been designed to make your stay a total relaxation. The villa offers spacious bedrooms and spacious living areas. Indoor and outdoor spaces with gardens, swimming pool with sea views and large lawns. The interior of the house is very light and airy with bay windows in all its rooms that offer the opportunity to enjoy the breathtaking views even in every room. Room, Ground level, direct access to the terrace, view of the sea. This bedroom has 1 double bed Queen size. Bathroom ensuite, With bathtub, shower. This bedroom includes also living area, dressing room. Room, Ground level, direct access to the terrace, view of the sea. This bedroom has 1 double bed Queen size. Bathroom ensuite, With shower. Room, Garden level, direct access to the garden, view of the sea. This bedroom has 1 double bed 180 cm. Bathroom ensuite, With shower. Room, Garden level, direct access to the terrace, view of the sea. This bedroom has 1 double bed 180 cm. Bathroom ensuite, With shower. Main entrance through the living / dining room and the kitchen. Lounge equipped with an international satellite TV and a Hi-fi system. Large dining room, very well equipped kitchen (dishwasher, ice machine, pasta machine, ...). The whole opens on a huge covered terrace of 150 m2 with dining room and outdoor living room. Living room with sitting area. Opens on a terrace overlooking the sea. Infinity pool (15 x 5 m - depth of 1.20 to 2.20m). 10 Sun loungers and parasols. Summer kitchen equipped with barbecue (charcoal), plancha, double fridge, freezer, Nespresso coffee machine. Jacuzzi with Swim 4x3 streaming (heated). 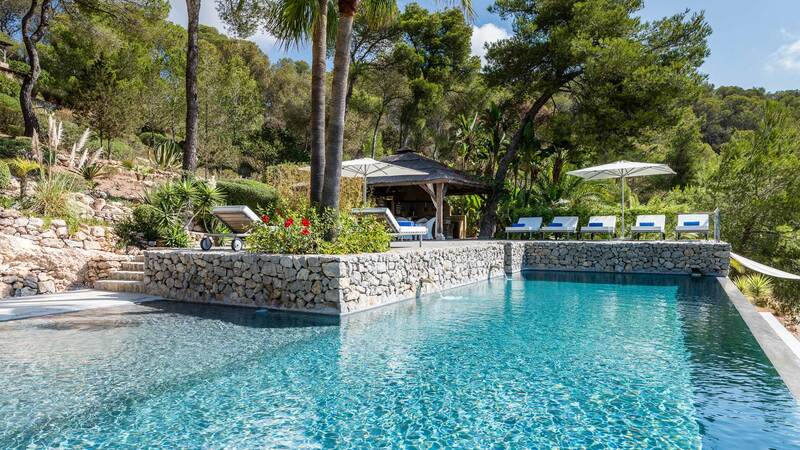 The villa is also close to everything you want for a perfect holiday in Ibiza with its famous beaches, restaurants and clubs nearby. A few minutes by car (path of about 2 km) the most beautiful beaches of the south of the island and its beach clubs (Blue Marlin, Tropicana, Yemanja). 8 minutes drive from the charming village of San José, cafes, bars, shops, restaurants. Salinas beach at 12 min (Jockey Club, Sa Trinxa). Restaurant / bar KM5 at 3 min. Ibiza town 15 min.